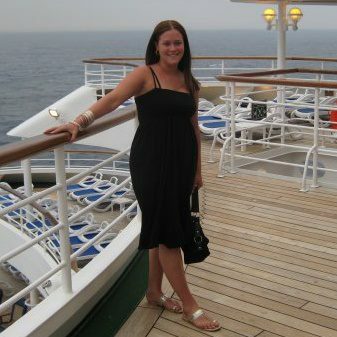 I found my passion for cruising back in 2007 when I embarked on my first cruise – a 12-night sailing to the Canary Islands onboard P&O Cruises Oriana. Cruising had never entered my mind, the thought of having a holiday onboard a ship was not appealing. I didn’t want to be confined to a space or pretend to be someone I’m not for two weeks and I certainly didn’t want to dress up every evening, after all, it was supposed to be a holiday. My first cruise was the complete opposite to everything I had imagined a cruise to be. It was fun, full of energy, the average age was definitely not 80 and I didn’t have to wear a dress every evening, as I had expected. Those twelve days onboard were a real eye opener and it is fair to say I definitely caught what is often referred to as “the cruising bug” (and no, I don’t mean norovirus). 50+ sailings and a World Cruise later and I’m still trying to sell the ocean to everyone I meet. When I am not at sea, I spend my ‘shore days’ working within cruise travel. I suppose I get the best of both worlds in that sense. You may have seen my name mentioned through expert comment, quotes for press purposes and in articles on the following: Travel Bulletin, The Sun Online, Direct Travel, Travel Daily News, TravelMole, Breaking Travel News, Travolution, Captain Greybeard Blog, World of Cruising, Cruise Critic U.K., Porthole, Cruise International and Cruise Industry News, just to name a few. Danielle it was a pleasure meeting you. You were a delight. Best to you and your friend and your 4 month adventure. Just came across your website,off on The Celebrity Eclipse on Saturday.Can it be as good as most of the comments suggest.Almost a Newby to cruising ,went on The Oriana 20 years ago.The Eclipse and Norway will be a complete new ball game ; we will see!!! I want to cruise the Mediterranean for my 50th birthday. October 2016. Ugh. I want to hit Italy, Greece, Turkey and maybe Croatia. Pretty flexible on dates when is the best time of year for great weather (not to hot) and pretty good prices. We’ve sailed Silver Seas and loved it! So want the luxury smaller cruise lines. Also, I do the miles and points game so is there a best program to follow for that? Thanks so much. Hi Sara 🙂 Thank you for your comment and welcome to my blog! I am glad you found me! Hopefully my cruise ramblings will help you decide on your next ocean adventure! Very encouraging. Going to cross the Bay of Biscay in Nov and Dec and I’m terrified it will be rough. But you survived an awful crossing which encourages me. Don’t want to cancel through fear! Always good to see ‘new’ converts to cruising and how much they enjoyed the experience, and this is invaluable advice for anything thinking of their first cruise. Hopefully more first-timers will get ‘the bug’ and enjoy reading along here, too! So nice to see I’m not alone being a young cruise obsessive, no-one else I know gets it! Hi CruiseMiss. I’m @carnivalcruises from Instagram. I am fascinated by your blog. I will add a picture of yours to my page, and I will continue to read your awesome blog! hi danielle, hope your well, its gary off the ventura, i sat with you and your friend, at the back of the ship chatting…. Danielle and Amanda I have loved reading your posts here since i found you a month or so ago. They really speak to why you love cruise and are full of usefull information. Thank you and keep up the good work. Happy sailings! Hello Nathan!! :o) Thank you for your kind words, I’m quite partial to your blog too!! hope to keep you coming back to read more!!! Hi Hubert. That sounds amazing! My next destination is the Med again in April, very excited!! loving the site so far. if there is anything i can contribute, please let me know!